TK Kiosk integrates the ability to exchange, share, and manage data/multimedia support in telecommunications, enhanced by an interactive data center. We lead the way in innovative, multi-function technology and hardware with focuses on strength, security, and safety. TK Kiosk’s business approach is driven by quality, innovation, and customization in order to optimize our clients’ business solutions. Support all stages of development including technical, commercial, marketing, and implementation. Anticipate market demands and provide an educated approach to high-risk, challenging circumstances. Provide the best-suited technologies, materials and software based on thorough product analysis and market research. TK Kiosk provides a platform for financial transactions through an easy-to-use, secure, and innovative interface. A data center handles all transactions in real time and guarantees a high levels of protection and identification security through methods such as biometric technology. The Kiosk is also able to connect payment-processing parties to the platform and its users. TK Kiosk is changing the future of cash withdrawals and deposits. With a direct link to the user's banking network, the exchange is safe and efficient. TK Kiosk can offer direct access to sporting, cultural, or entertainment events. During an event, the Kiosk can be placed on-site for automated patron check-in and in-person ticket or merchandise purchases. These payments can be made via cash or a variety of cards. The Kiosk can be used for advertising through its Internet connected platform. The Kiosk also has multichannel access that gives users access to information about the preparation, organization, and reservation of an event. TK Kiosk becomes a key point in optimizing sales as it gives customers easy access to information, promotions, and advertising campaigns. The interface allows for purchasing at the Kiosk, home delivery selection, and the ability to return the goods back to the point of sale. An entire purchase can be made without ever having to enter a retail space. E-coupons can also be printed through the Kiosk, shared on a smart phone, or pushed to any other device the user desires. An adaptable technology, TK Kiosk is a customizable platform, built to answer the needs of diverse markets around the world. TK Kiosk provides a platform for financial transactions through an easy-to-use, secure, and innovative interface. A data center handles all transactions in real time and guarantees a high levels of protection and identification security through methods such as biometric technology. The Kiosk is also able to connect payment-processing parties to the platform and its users. With a direct link to the user's banking network, the exchange is safe and efficient. With a strong material-to-weight ratio, carbon fiber has the advantage of longevity since it does not wear down, bend, or corrode over time. Carbon fiber is commonly used in industrial fields, but is still fairly unknown to the general public in structural and aesthetic forms. Carbon fiber makes up 60% of the Kiosk’s structure. Iron, the most commonly used steel, easily oxidizes. This process results in rust, which causes the material to dissolve and/or crumble after contact with moisture. To stop this effect, a layer of chromium is added to protect the core matter. The material is then non-oxidizing, making it stainless steel. The interior architecture of the Kiosk is made up entirely of stainless steel, which is ideal for securing the sensitive components. TK Kiosk has a valuable partnership with TK Systems, which ensures security for the Kiosk software. TK Systems provides a web platform that allows complete traceability during the life cycle of the Kiosk. 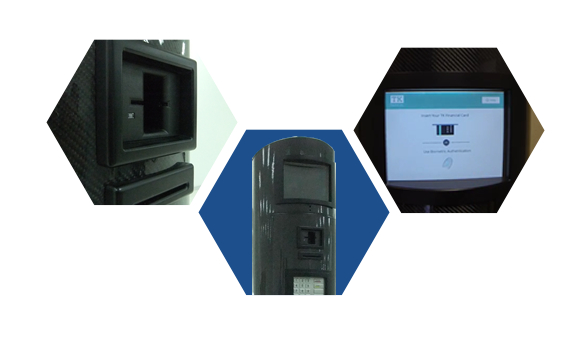 TK Systems also provides a secure access point for TK Kiosk partners; this access point enables partners to pull or push information from one or more Kiosks. The Kiosk can be customized and equipped with any type of colored fiberglass, either in whole or in partial composition with the standard carbon fiber. This allows the Kiosk to aesthetically optimize its environment. Various other finishes are available, such as fiberglass, kevlar, metal fiber, natural fiber, or an aluminum alloy. Final rendering can either be subdued, brightly colored, matte, or polished, depending on the manufacturing process used. The Kiosk was originally designed to be finished in carbon and glass fiber, but has evolved according to market needs, technical characteristics, industrialization capacities, and the surrounding environment. TK Kiosk collaborates with industry partners located in various countries around the world. Depending on certain criteria, such as production volumes or production restrictions, Kiosk manufacturing locations can be implemented in the target market's geographical location. TK Kiosk works with world-renowned, certified manufacturers and suppliers to ensure quality and performance. All equipment used exceeds expectations in every aspect of production and all parts have been adapted to meet the high-level standards of TK Kiosk. This is one of the most crucial steps in the life of a product for maximum operability. TK Kiosk has partnered with established companies that provide local services through their presence in multiple countries. They have a thorough knowledge of TK Kiosk products, which leads to professional and efficient services. If you have any questions about TK Kiosk, please contact us using the form below and we will get back to you as soon as possible. Copyright © 2018 TK Kiosk Inc. Michel Salomon. All Rights Reserved.